35 Foot Catamaran for Home Building "Two Hoots"
Many people wonder about what the benefits of ocean races are to ordinary sailors. Races like the OSTAR and La Route du Rhum, where enormous sums of money are spent on the latest technology, materials, and systems, to assist the shorthanded sailors to sail the boats as fast and as safely as possible. Yet, in the fast moving world of multihulls I believe that it is possible to see a direct correlation between the money spent on developing high-tech race boats and cruising designs. 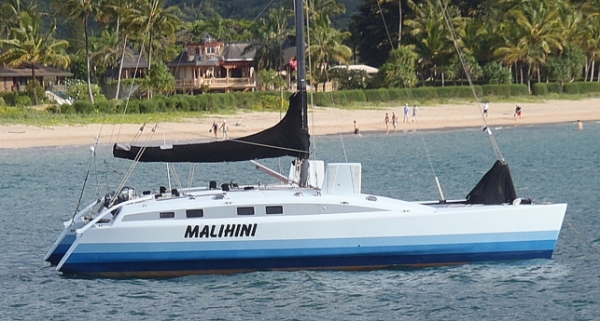 This catamaran is an excellent example of such a boat... it is the payoff for the cruising multihull. The main aim of this design was to produce a catamaran that would embody all the benefits learned on the ocean-racing circuit of the North Atlantic, and yet provide comfortable accommodation for six, with a spacious cockpit for outdoor living in the tropics. Most cruising boats are a compromise in one way or another, but for this design I was determined to try and produce interior volume without compromising all we have learned about seaworthiness, speed upwind, and underwater hull shapes. Some years ago while crossing the Atlantic on our 40' trimaran, which has a flare in the main hull (6" above the waterline), I had been sitting on the windward outrigger watching the water flow past the main hull, when it occurred to me that as far as the seas were concerned the hull might just as well be the outer hull of a cat. This flare dramatically increases interior volume, while only marginally increasing frontal area. And, most important, it allows the underwater hull shape to be optimised for speed. In modern trimaran design it has been clearly established that pitching can be greatly reduced if the centre of buoyancy of the outrigger is forward of the centre of gravity of the boat, and moves forward with increasing immersion. In a catamaran the centre of buoyancy of each hull at rest, has to be directly under the centre of gravity. But, by flaring the forward sections above the waterline slightly more than the stern sections, the centre of buoyancy of the downwind hull can be made to move forward as the boat heels, giving the same excellent pitching control as a trimaran. So, the flare can be used to increase interior volume and the seakeeping qualities of the boat. The flare not only increases the interior space but also allows me to design a hull that has the properties described above. As the boat heels, the centre of buoyancy moves forward in the downwind hull, lifting the bows, assisted by two other forces. The inward canted daggerboard (forward of the centre of gravity) and the elliptical forward sections of the hull give dynamic lift. All these factors ensure that the bow will never bury (the major cause of pitchpoling) and allow the boat to develop full power off the wind, due to the very wide beam. The flare never submerges, but only drops to 6" above the waterline when the windward hull leaves the water, i.e. exactly the same as a trimaran main hull with a flare. The accommodation is more than double that of the equivalent sized trimaran and with a weight-carrying capacity of 1.5 tonnes she will make a sensible long-distance liveaboard cruiser, while in her stripped-out state. In racing trim, she wilI be an exciting performer by any standard. The pitching can be controlled by the hull shape, to a large extent, and the movement of the centre of buoyancy described above. In order to control the rig, the hull configuration needs to be as stiff as possible, and fore-and-aft stiffness is particularly vital to forestay tension. Previously I have dealt with ways of achieving fore-and-aft stiffness in light trimaran hulls, yet, if we look at this design we effectively have two trimaran hulls to resist bending, thus the forestay is strongly connected by means of the aluminium T, with the ends built into the hulls. The fore-and-aft tube provides attachments for intermediate and babystays, and also for the strong safety net. The other great advantage of the large volume hulls is that they are very stiff in torsion and by using a technique I call integreted structure, where the hulls and crossbeams are buiIt as an integral unit, twisting is very well controlled. The double-diamond allows for the narrow sheeting angles required for excellent upwind performance, and the capshroud is anchored to the main crossbeam, the strongest structural member in the boat. The running backstays are shown in the cruising position where they can both be left on for beating, another chainplate closer to the centreline allows for better rig control when racing. By carrying over the structural technique developed for our racing trimaran designs and eliminating the bridgedeck accommodation, a very strong sleek boat with a low profile can be built. A fairing on the forward beam streamlines the airflow past the cockpit. This beam is one metre above the water, and with the flare forward, very little water will slam into the bridgedeck with its attendant breaking action. There has been a tendency in multihulls to reduce the size of the daggerboards on the basis that they sail faster and, hence, need less area to provide the same lift. I have never agreed with this philosophy and in my designs I am making the daggerboards as deep as the structure will allow. I would consider 11 foot draft as normal for a 60-footer, with the board down. Bruce Banks, sailmaker for Livery Dole 111 said "The only boat that could come near to this for pointing ability is a 12 Meter." That is high praise from one of the sailmakers to the Victory syndicate. Therefore the boards on this catamaran are larger than usual, with the intention that both should be used in light airs, retracting the downwind board as the wind increases. Favouring the use of the upwind board in stronger winds means that weather helm can be reduced, but a more important effect is that the capsizing moment on the boat decreases as the boat heels until (in the most extreme case) the hull and board iift clear of the water and the downwind hull is able to sideslip, assisted by the extra buoyancy of the flared topside. in the unlikely event of a capsize this boat (like all my designs) is designed to float on watertight compartments built into the crossbeams, which are the strongest structural members of the boat. in my opinion it is essential that the boat float as high out of the water as possible (in the inverted position) for crew comfort and to relieve stress on the structure. This design lends itself particularly well to self-righting, and work is in progress to prove the system. The wide beam ensures that full power can be developed from the rig when going upwind and on a reach. On the other hand, the width allows for a very spacious cockpit and great stability when lying a hull, should the need ever arise. With each hull wider than the normal catamaran hull, the unsupported span of the main crossbeam is only 3.4m (11ft 3"), greatly reducing the loadings on the beam in relation to the stability. All controls for halyards and reefing lead to three winches on the front beam, so all sail handling can be carried out without ever leaving the cockpit. An option of two tillers or wheels is offered for steering, with spray dodgers to protect the helmsman when going upwind. With kick-up rudders and a draft of only 18 inches, fully loaded, this boat will be able to be sailed right up to the beach or slip into many secluded anchorages. The structural techniques used in this design are a development from my ocean racing trimarans. Construction is unidirectional glass fibre/Airex foam. The idea of an integrated structure is that the boat is built as a unit (not as two hulls tied together with a couple of crossbeams). All reinforcing fibres in areas of stress are laid up so to carry the loads away into the hulls. The construction could be modified to use WEST SYSTEM epoxy with unidirectional glass reinforcing. This design is meant for serious offshore sailing with live aboard potential. A load-carrying capacity of 1.5 tonnes will allow for all those interesting mementos one collects on a large voyage, plus the scuba gear, windsurfers, bicycles, and all the other items that seem to appear on board after a few years afloat. And yet, when you return to base and unload it all, you will have an exciting performer capable of competing with all but the flat-out racing machines. This design is the smallest in a range of four up to 55 feet. The first boat was the 42-foot version, which was launched in England early in the spring of 1984. It was based at Cowes until the summer of 1985. Anyone interested in the concept can see her in the Caribbean where whe is now based. This 35ft version has been built in Holland England and Hawaii. Take some time and examine the design images.